It's time for our Fancy Friday Blog Hop. Our Fancy Friday team consists of some of the most talented Stampin' Up! demonstrators around. 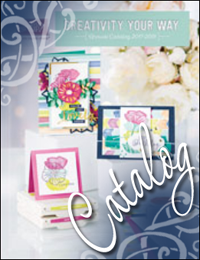 Our challenge this month is to tell about the new Memories & More products in the Annual Catalog and then create projects using them. Memories and More is a pocket scrapbooking system very much like the one we used to carry, except they are much more affordable...only $10 USD. What a bargain! But just exactly what do you do with them? In their most basic form, you just slip them into the pockets along with your photos. But you know me...simple just isn't an option...I love to stamp, embellish, punch and so much more. I used the Petal Garden Memories & More kit and I have several projects for today's blog hop. The cards come in two sizes. I like to make card fronts using the 4"x6" cards. Simply trim the excess and build a 5.5"x4.25" card. That is what I did on these first three projects. Of course, not every card in the kit will work for this, but they are perfect for journaling in your memory albums. On this card, I made a Calypso Coral card base and layered on the card front. I cut the sentiment from the duplicate card (there are two of each design in the kit) and used some dimensionals to pop it up. I also added some linen thread and a few scraps to give the sentiment more emphasis. Finally, I fussy cut a rose from one of the smaller cards to use as an embellishment. For my second project I used one of the cards, wrapped on some linen thread, attached some scrap pieces with a staple, die cut some Gold Glimmer Paper with the Lovely Words Thinlits Dies and added everything to a Calypso Coral top-folding card base. For this project I stamped a sentiment from the One Big Meaning stamp set with Basic Black ink, trimmed the card down to 5"x3.75" and layered it on a second card (5.25"x4"). I mounted everything on a top-folding Whisper White card base. One of my favorite things to do is fussy cut; I find it very relaxing. So I fussy cut the flowers from the second matching card in the set and popped them up with dimensionals and offset them slightly. This little step adds so much interest. For my next four projects I used the 3"x4" cards from the set to create notecards. The thing I love about this is that this size is usable in your memory albums and they also make great gift tags...super versatile! You can also jot a little note of encouragement on one and slip it into your child's lunch box. I trimmed off the sides of the sentiment card and added it to a second card from the set using dimensionals. Then I used one of the stickers from the kit for an embellishment. It doesn't get much easier than this! For this notecard I trimmed a smidge off the bottom and added a contrasting piece to the bottom with some scraps. I tied on some linen thread and added one of the sentiment stickers from the kit. For the next project I cut about 1/2" off the top of the card so that I could reach the word "dream" with the Pretty Label punch. Then I flipped the card over and used the opposite side to frame the word. I mounted everything on another contrasting card from the kit and tied on a bow made with a strand of burlap ribbon. Finally, I added a coordinating flower sticker from the kit. And last, but not least, I used pieces and parts to give depth and dimension to this easy notecard and embellished it with a flower sticker from the kit. Tags: Fancy Friday, Memories & More, memory keeping, Petal Garden, scrapbooking, Stampin' Up!